Bursitis is an inflammation in one of the small, fluid-filled sacs (bursae) often found near joints in the body. It can be very painful and limit mobility. The inflammation can result when too much pressure is put on one of these sacs (a bursa). The bursae (Latin for bags) are made of connective tissue and filled with synovial fluid. Like tiny pillows, they cushion parts of the body like the elbows, which are often exposed to friction or pressure. When you prop your elbows on a hard tabletop, the bursa prevents the bone from pressing too hard against your skin. There are over one hundred bursae in the human body, many of them near joints. Bursitis can also be caused by a – usually bacterial – infection. If a bursa becomes inflamed, more fluid will build up inside it than usual. Doctors call this effusion. This leads to swelling that you can feel and see from the outside – especially if the inflamed bursa is right under the skin. The swollen area hurts when resting, but is especially painful when moved or when pressure is put on it from the outside. It sometimes looks red and feel warm too. You may also develop a fever and generally feel unwell. 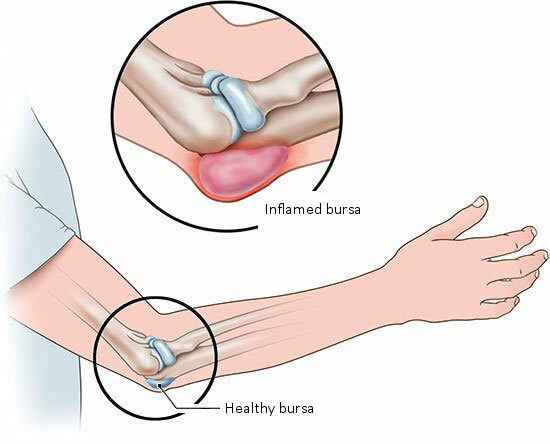 Bursae often become inflamed if they are injured by a heavy blow – for example during a fall – or if they are irritated by too much friction or pressure. For this reason, some jobs are associated with a higher risk of bursitis. Tile installers are a typical example: Their work often involves kneeling on hard floors, so it’s not unusual for them to develop kneecap bursitis. Other high-risk occupations include cleaners, carpenters, roofers and gardeners. Working for a long time at a computer or doing some types of sports such as volleyball may also make bursitis more likely. Germs like bacteria can enter the bursa too, causing inflammation there. This may happen due to an injury – but it’s often not possible to tell how the bacteria got inside the bursa. Sometimes inflammatory diseases such as rheumatoid arthritis and gout spread to the bursae as well, causing bursitis. Each year, at least 1 out of 10,000 people develop bursitis on the knees or elbows alone. One third of these inflammations are caused by a bacterial infection. Middle-aged men are often affected. That’s probably because they more commonly have jobs that are associated with a greater risk of bursitis. If the area is rested, the inflammation usually goes away within 2 or 3 weeks. Sometimes it remains permanently, though – for example, because the person continues (or has to continue) doing the activity that caused it in the first place. Chronic diseases such as diabetes and rheumatoid arthritis may delay recovery too, or even make the inflammation worse. Inflamed bursae that are right under the skin can easily be diagnosed: They are swollen and painful, and are sensitive to pressure. Reddened, warm skin is also a sign of inflammation. Bursitis most commonly affects the elbows, knees, shoulders, hips and feet. It’s important to find out whether the inflammation is caused by bacteria. If you have a fever and/or a wound close to the inflamed area, it is likely to be a bacterial infection. In order to check whether that is the case, the doctor takes some fluid from the bursa using a hollow needle (cannula) and has it tested in a laboratory. Blood tests can detect further signs of an infection or show whether the inflammation is being caused by a disease such as gout. Imaging techniques like ultrasound or x-rays are used to rule out other possible causes of the symptoms, such as bone or joint injuries. They can also help to check whether the bursitis may have already damaged nearby tissue. The most commonly recommended treatments for bursitis involve keeping the swollen area still (immobilized) and protecting it from further pressure. Things like cold packs or painkillers can help. After the inflammation goes away, it’s important to avoid putting too much pressure on the joint to stop bursitis from coming back. For instance, people who often work in a kneeling position can use kneepads to protect their knees. If you are wondering whether such measures could help, you can seek advice – perhaps from an occupational health specialist. If the bursitis doesn’t get better or comes back despite taking the measures described here, steroids are sometimes injected into the bursa. If the inflammation becomes chronic, the affected bursa is usually surgically removed. In cases where bursitis is caused by a bacterial infection, surgery is more urgently recommended. But bacterial bursitis is first treated with antibiotics, which is often enough. Steroids aren’t used, though. They would do more harm than good in this case. Other medication may be needed if the bursitis is caused by a particular medical condition like gout or rheumatoid arthritis. Lippert H. Lehrbuch Anatomie. München: Urban und Fischer; 2003.